You may think it’s weird that a movie about a Hollywood agent who specializes in child actors would start off with a situation lifted from "Carlito’s Way," but on the other hand, consider that a warning. Its perky poster notwithstanding, "Trust Me" is a putatively hard-edged comedy that promises to turn into something harder. What makes it a crummy picture is that it really doesn’t turn into something harder, and it’s not that hot before it makes the turn, either. We’ll get to that. 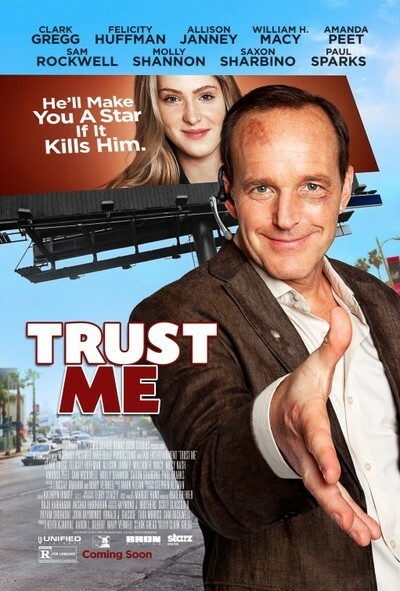 After the confounding opening featuring narration from a mortally wounded character, "Trust Me," the second feature directed by busy actor Clark Gregg, who also stars here, shifts into inside-showbiz-satire mode, or so it seems. Gregg, who also wrote the script, plays Howard, a puppy-dog-eager but down-on-his-luck agent whose pep talks to his clients are peppered with references to his own past as a child performer ("on my third call-back for ‘Boatniks,’" etc.). Howard’s been there, he knows, he cares, and yet he keeps losing kids to rapacious rival Aldo (Sam Rockwell, star of Gregg’s prior feature "Choke," and here doing an odd verbal impersonation of Jeff Goldblum). Things seem to start looking up for Howard when he stumbles upon beautiful teen Lydia (Saxon Sharbino), a volatile girl possessed of emotional quicksilver, perfect for a role in an upcoming teen-vampire-franchise movie that could make megabucks for her, for Howard, and for Lydia’s drunkard dad. This portion of the film, during which hapless Howard also pursues an attractive neighbor played by Amanda Peet, aspires to "Sweet Smell of Success" meets "The Player" meets "The Big Picture" acuity, and despite the knowing name-drops (the vampire movie has attracted Ang Lee as director, Helen Mirren as adult lead) and the arrogant bad behavior of a producer played by Felicity Huffman, and much else in the way of wants-to-be-verisimilitude, it never gets in swinging distance of such a thing. And then the movie opts to up the ante and place Howard in a film-noir snare that, among other things, recontextualizes the idea of the femme fatale in a decidedly unhealthy way. Weird borderline misogyny aside, the movie also lacks genuine wit, and ameliorates whatever tragic sense of cynicism it aspires to with pointless displays of sentimentality, most of it directed at its lead character, who’s often depicted in profile, looking kind of wistful, as a random music cue by composer Mark Killan drops a little treacle into the mix. Gregg is a genuinely gifted actor but his other ambitions really get the better of him with this project, I’m sorry to say.